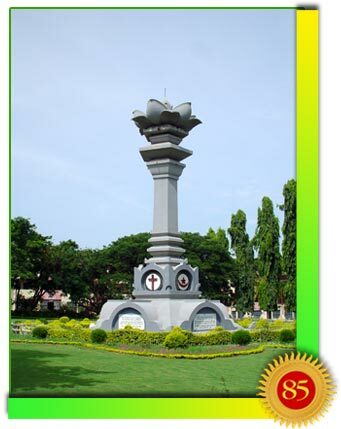 Baba repeatedly points out that the values of Truth, Peace, Love, Non-violence and Right Conduct have remained the core foundation of humanity’s myriad belief systems throughout history; that is the reason why the logo of the Sai Organisation symbolises the major religions of the world. Amplifying this important aspect of the Sai mission, the Sarva Dharma Stupa or the pillar of all faiths has been standing tall at the centre of Baba’s ashram, Prashanti Nilayam, since early years. According to Baba, all religions teach the five basic values of Sathya (Truth), Dharma (Right Conduct), Shanti (Peace), Prema (Love) and Ahimsa (Non-violence). This episode of H2H features inspiring thought from the five religions that are represented on the Sarva Dharma Stupa in Prashanti Nilayam. Prahlada, the son of the demon king, Hiranyakashipu, was devoted to Lord Vishnu. Revolted by his child’s worship, the father devised tortures for him. Much to his angst, Vishnu would come to the rescue of Prahlada at every instance. Prahlada’s grandson, Bali, was also a firm devotee of the Lord. Baba retells this story of Bali, who steadfastly held to the truth by being true to his word. Baba says: “Bali too was engaged in the glorification of God and in the material and spiritual uplift of his subjects. There was no trace of poverty or ill health in his empire. Every home was lit with joy, every day a festive occasion. “He decided to celebrate an elaborate sacrificial rite, to propitiate the Gods so that, with their blessings, he could extend his beneficent rule over the entire world. The Lord utilised this opportunity to shower Grace on him. He incarnated as Vamana, the dwarf, and proceeded to the sacrificial altar in the form of a mendicant student. Bali welcomed Him and offered Him a gift. 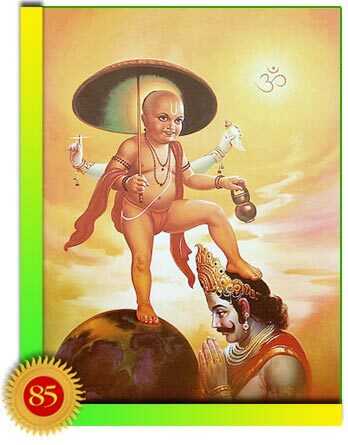 Asked what he would accept as a gift, Vamana replied He wanted only the amount of ground measured by three strides of His feet. Surprised at the answer, Bali momentarily doubted the intention and identity of this strange visitor. His preceptor, Sukra, warned him against fulfilling his offer. But, Bali stood by his word. He permitted Vamana to measure for Himself the three strides of ground. As we come to the end of this story, let us resolve to offer all bitterness in the sacred fire and emerge grand, great and godly. 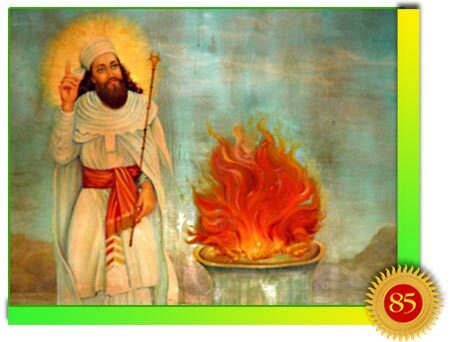 Zoroastrianism, the ancient religion of Iran and practiced today by the Parsi community in India, has the concept of Dharma expressed as Asha. Asha is interpreted variously as truth, order, justice, righteousness, and godliness; it is an inseparable quality of Ahura Mazda, God. Ahura Mazda is the master of Asha and also its creator. Where He prevails, Asha reigns. Asha is divinity itself. Asha makes things beautiful and perfect. Asha was created to uphold the entire creation and establish righteousness. In the physical realm, Asha is represented by fire. The symbolism is understandable because in darkness, fire makes things visible and meaningful to help us make sense out of them and act accordingly. According to Zoroastrian tenets, fire has the capability to purify things and make them truthful and divine. Fire is used in the sacrificial rituals because of its nature to sanctify. Fire is a symbol of light and life. Where these exist there is order, beauty and the presence of God. Fire has the ability to drive away the darkness, which brings chaos and confusion to our minds. Remember the wheel of cause and consequence, of deed and destiny, and the wheel of Dharma that guides them all. 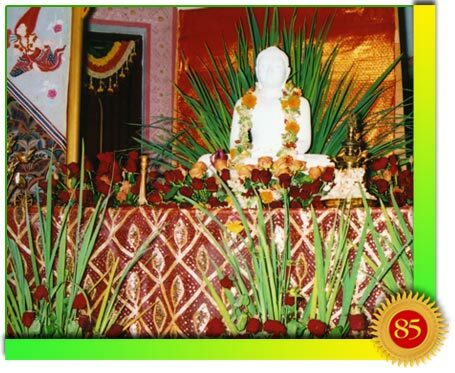 The basic tenets of Buddhism give a practical guidance to Realisation and Peace. The Dharmachakra or the Wheel of Law began to turn when the Buddha taught the five ascetics, his first disciples, in the Deer Park at Sarnath. The Buddha taught The Four Noble Truths: The Truth of suffering, The Truth of the cause of suffering, The Truth of the end of suffering and The Truth of the path that leads to the end of suffering. What is suffering? There is obvious physical suffering, hunger, pain and illness. But it is also subtle. Since everything changes with time, so the state of happiness is similarly affected. Knowledge of the pending loss of happiness is a form a suffering. Recognition of this universal suffering is the First Noble Truth. The Second Noble Truth is the recognition of the cause of universal suffering. Once the aspirant becomes aware of what suffering is, he begins removing its causes. He discontinues engaging in actions that create suffering. To stop these activities, he digs into their roots. He discovers the mental pollutions and unhealthy attitudes. He must completely eliminate these and ought to delve deeper to the heart of the matter, which is his belief in a self. If the aspirant comes to this realisation, he will attain the wisdom of non-self. Through understanding the absence of a self, he no longer creates the pollutions of the mind and the bad actions they bring. The whole process thus comes to an end. It ceases to be. At this moment, the aspirant realises the Third Noble Truth of cessation. The very essence and nature of cessation is peace. The peace he obtains from the cessation of everything unhealthy is the deepest happiness and bliss. Within that peace, all the powers of liberation and wisdom are developed. The Fourth Noble Truth is called the truth of the path because it describes the way that leads to liberation. There are five stages here which are the stages of accumulation, junction, insight, cultivation of insight and, finally, the stage of Buddhahood. Following the first three stages, the aspirant accumulates a great wealth of knowledge. 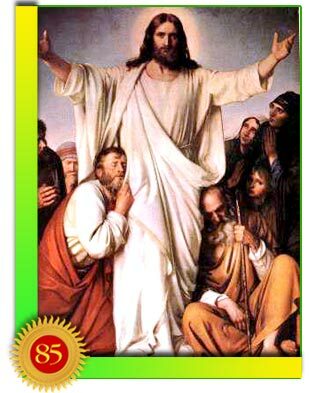 He cultivates diligence, good qualities and the wisdom to penetrate deeply into the meaning of things. He uproots the belief in the self. A long process is required to remove that well-established conditioning of self. It needs one to be accustomed to the truth of non-self. This is the fourth stage of the cultivation of insight. Through insight, the aspirant then arrives at the fifth and last stage that signifies the end of study. At this, the goal of Buddhahood is attained. The thoughts presented here inspire us to be like the star that never wavers from the crescent, but is ever fixed in steady faith. 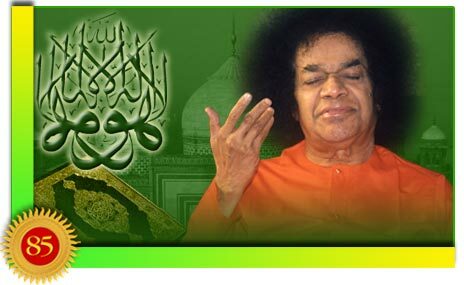 Baba relates this Muslim story about selfless service and the expression of universal love. “Abdullah was sleeping in the corner of a mosque in Mecca when he was awakened by the conversation of two angels above his head. They were preparing a list of the Blessed. One angel was telling the other that a certain Mahbub of Sikandar deserved to be ranked first, even though he had not come on pilgrimage to the Holy City of Mecca. Hearing this, Abdullah went to Sikandar and found that Mahbub was a cobbler, repairing the shoes of people. He was famished and poor. His earnings barely sufficed to keep flesh and bone together. He had, by severe sacrifice, piled up a few coppers during the course of years. In the teachings of Jesus, the concept of Ahimsa or non-violence is explicitly stated. “But I say unto you, That ye resist not evil: but whosoever shall smite thee on the right cheek, turn to him the other also. “And if any man will sue thee at the law, and take away thy coat, let him have thy cloke also. “And whosoever shall compel thee to go a mile, go with him twain. “That ye may be the children of your Father which is in heaven: for he maketh his sun rise on the evil and on the good, and sendeth rain on the just and on the unjust. “For if ye love them which love you, what reward have ye? Do not even the publicans the same? “And if ye salute your brethren only, what do ye more than others? Do not even the publicans so? In His interpretation, Baba has said: “When rain pours down from the sky, pure water falls on the earth, mountains, rivers and the sea. But this water acquires the colour and taste of the region or spot where it falls. 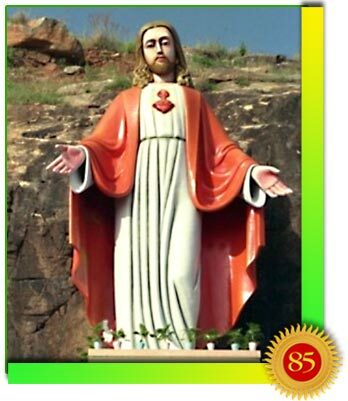 Likewise, prophets and messiahs, appearing in different forms at different times, imparted their message in terms appropriate to the time, the place and the conditions of the people concerned. “Religions cannot be considered different from each other for this reason. “All religions have taught only what is good for humanity. Religion should be practiced with this awareness. If the minds are pure, how can religion be bad? For the past 70 years, Bhagavan Baba has actively fostered the five human values of truth, righteousness, peace, love and non-violence. He urges every human being to practice secular humanism within the framework of the faith of their birth or choice. What makes the Sai Avatar so unique is that there is not even a hint of proselytizing involved in the Sai movement. For Baba, Hindus and Muslims, Sikhs, Parsis, Jews, Christians, Jains, Buddhists, atheists and agnostics are all divine beings. Each of us is here to rise above the mundane by recognising the sacredness of our own life and that of all life forms around us. Once we experience this interconnectivity, we can look past the external differences. Then the values of truth, peace, love, right conduct and nonviolence become a way of life, as natural as breathing. That is when the brotherhood of man and fatherhood of God will come to actualisation. Baba’s call to practice the human values in all areas of our lives has been demonstrated throughout His own life. Truly, His life continues to be His message.